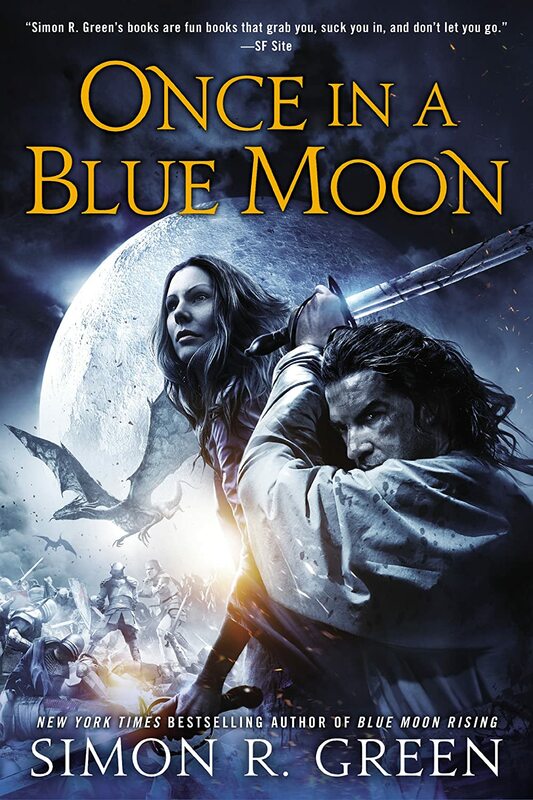 Post subject: Once in a Blue Moon Cover and Synopsis!!! Twice upon a time, Prince Rupert and Princess Julia saved the Forest Kingdom. They have earned the right to live happily ever after. Hawk and Fisher, famous for their years of keeping the peace in Haven, are really quite happy being legends. They gave up the hero business when they decided they’d grown too old for it. Now they run the Hero Academy, training young hopefuls to be heroes. Legends never die, but it seems they cannot retire, either. Hawk and Fisher’s adult children, Jack and Gillian, have been kidnapped. They were taken by the Demon Prince, an old enemy from the Forest Kingdom who challenges the couple to one final battle for their lives. But Hawk and Fisher believe there’s another motive behind the abductions, one connected to a case they worked in Haven many years ago—a case they refuse to discuss. Someone at Penguin's on the ball! Simon's only just received the MS to proof read!! I think we should run a compo on this, maybe over Christmas as it's a Jan release. Oh Halleluiah...Oh happy day oh rapture of such sweetness! Roll on January 7th next year! Suffice to say the few good points this year have been Simon's books! And now a definite date and cover art and synopsis for the return of Rupert and Julia! This is a good day! Oh yes a competition is a great idea!!! Oooo super excited! Anyone notice that Hawk isn't wearing the eyepatch in the cover art? I thought I remember him putting it on again after the events in Reverie, but maybe I'm remembering wrong. Here's to hoping Chappie is still in the story! Pretty sure that is not Hawk and Fisher... I think the picture is of their adult children, as the synopsis says. I like the idea of a competition. Preferably one I can win. Do we know if this is getting a UK release, at any point in the foreseeable future? Tell me Luc, have we ever run a compo you haven't won? No UK release, no UK publisher Until that changes Simon won't be available here. Mind you, after talking to Simon ex UK editor when she did the commentary track for JG it would appear that UK publishing is in a right mess at the moment. I'm fairly sure there is a competition I haven't won. Can't think what it might have been at the moment, but fairly sure, anyway. IF I can get some and IF they come soon enough I MIGHT have them before Christmas.